I’ve been loving my time with the Sci-Fi Chronicles book. And as I believe I’ve mentioned before, the book doesn’t only cover film and television, it deals with stage, music, comics and novels. 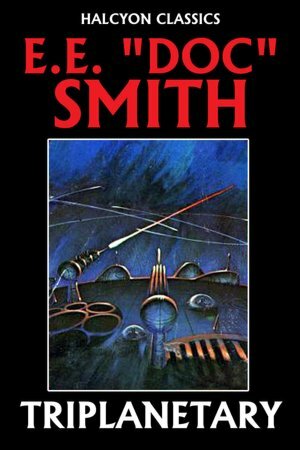 Being in the midst of the pulp era of science fiction, I thought I would take a look at one of the series that the influenced so many stories that followed it. This is space opera of the highest caliber, where death is omnipresent, force-fields and rays, beautiful women and hideous villains, determined heroes, blossoming federations and the side of right are all center stage. That being said, considering a lot of this was written in the 30s and 40s, it’s pretty dense in its wordage. And, if I had known that this novel serves merely as prologue for everything to come, I may have skipped it. I couldn’t get hooked, and some of the plot holes were so wide you could maneuver a Death Star through. The first part of the book is back story, chronicling the conflict between the Arisians and the Eddore, essentially the powers of good and evil respectively, as they begin a war for the galaxy, using Earth as both pawn and testing ground. We spend time in Atlantis, an attempted assassination of Nero in Rome (apparently he was in an Eddore named Gharlane in human form), World War I, II, and III. The second part finds us in the far-flung future on a ship that is coming under attack by pirates, led by Gray Roger (Gharlane again – the Eddore have an impressive life span). A young woman, Clio Marsden is saved from death by Costigan Conway, who is actually an undercover Triplanetary operative. He and the ship’s captain, Bradley get away from the attack, but are captured by Roger. Saving Clio from the advances of Roger (Gharlane wants to conduct all manner of *ahem* experiments on her), the trio make another escape, only to be taken aboard a newly arrived ship manned by an amphibian race known as Nevians. Returning to their home planet to put the three specimens on display, they turn the rest of the fleet to so much slag so they can take the much-needed iron on board. Luckily, they don’t take any of our hero’s tools or communication devices away, so the three can plan their escape, and when able to, can contact Earth, who also suffers a Nevian attack (see ya Pittsburgh!). There are more escapes, battles, and super-ships, but the language weighs it down too much. It wants to read faster and more enjoyably than it does, but its the phrasing of concepts we take for granted that just causes too many problems. I read the entire series back in the 1960s. It’s epic in scope and good fun.